If good fences make good neighbors, then Shino and Ken Mori are the best neighbors ever. They invite us past the charred cedar facade of their Southern California home. A gently winding set of exposed aggregate concrete pads leads to the Wabi House’s front door. Mariscal sought to “hide the house behind a dense forest front yard.” As the crape myrtles grow in, they will further filter the home’s facade. During construction, Mariscal’s team adjusted the design to accommodate the boughs of an old pine tree in the backyard. The unique detail imbues the home with a spirit of wabi-sabi—or beauty through imperfection. 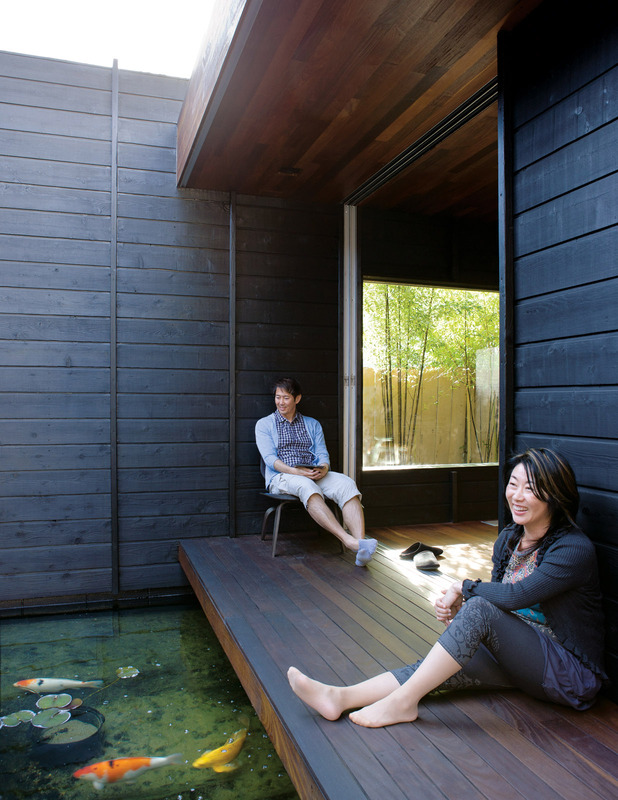 With doors open, Shino and Ken pull an Eames LCW chair for Herman Miller outside to enjoy the space. A perpendicular walkway leads right to the garage and laundry areas. After entering through the front door, visitors pass over the large koi pond on a cast-concrete footbridge chiseled to look like stone. The entrance to the living room includes a seating area where guests can remove their shoes. At the client’s request the kitchen contains neither upper cabinets (Shino can’t reach them) nor an oven (they only used the old one once—to reheat a pizza). A modular Roche Bobois Mah Jong sofa adds a decorative flourish to the living area while maintaining as low a profile as the traditional Japanese furniture. A custom-tailored mechanism allows six floor-to-ceiling sliding glass doors to open along the entire width of the living space, creating a seamless transition from indoors to out. 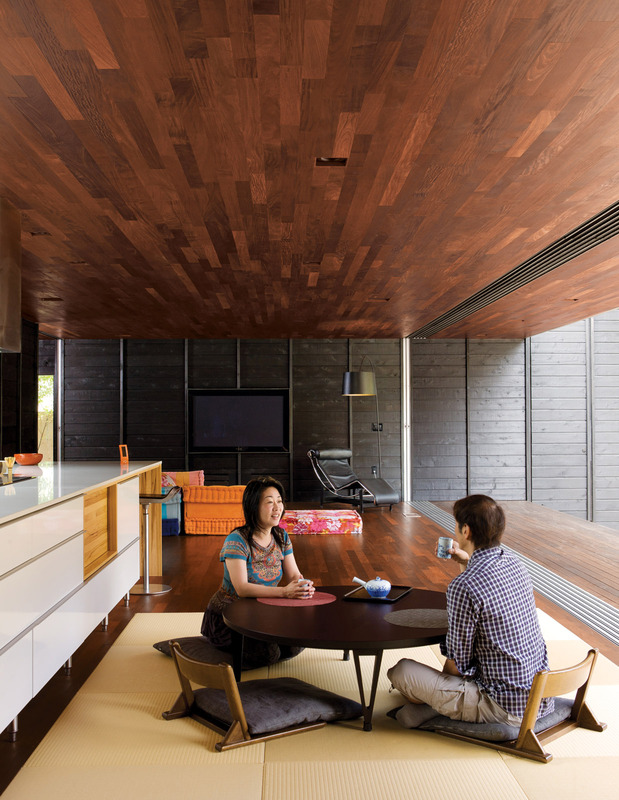 While most of the ground level is given over to the large open living and dining area, it also includes a small pantry, office, and Japanese bathroom. An integrated Sub-Zero refrigerator is almost unnoticeable behind its charred cedar cladding. In the cheerily outfitted office, a Herman Miller Embody chair lets Shino stay comfortable on business calls that can last for hours. The limestone-clad volume at the east end of the house extends to the second story, housing Shino and Ken’s master suite, which opens onto the planted roof deck. The couple asked for a “no maintenance, not low maintenance” backyard. However, Shino tends to “Carlsbad's largest public bathroom for cats” (otherwise known as their Japanese-style rock garden) about once a month. Image courtesy of ©2010 DANIEL HENNESSY PHOTOGRAPHY. And the Wabi House, which architect Sebastian Mariscal designed for the couple three years ago, is, on its face, not much. In fact, from the perfectly ordinary suburban street on which it sits, it’s little more than a white cube rising from a black rectangle. But just as the calligraphy encourages the home’s residents to find greater meaning within, so too does the Wabi House itself. With doors open, Shino and Ken pull an Eames LCW chair for Herman Miller outside to enjoy the space. Image courtesy of ©2010 DANIEL HENNESSY PHOTOGRAPHY. “From the list of what Shino and Ken wanted and didn’t want, I could sense that they were sub-consciously requesting an introspective house,” says the bicoastal Mariscal, who has offices in Woodstock, New York, and San Diego, California. 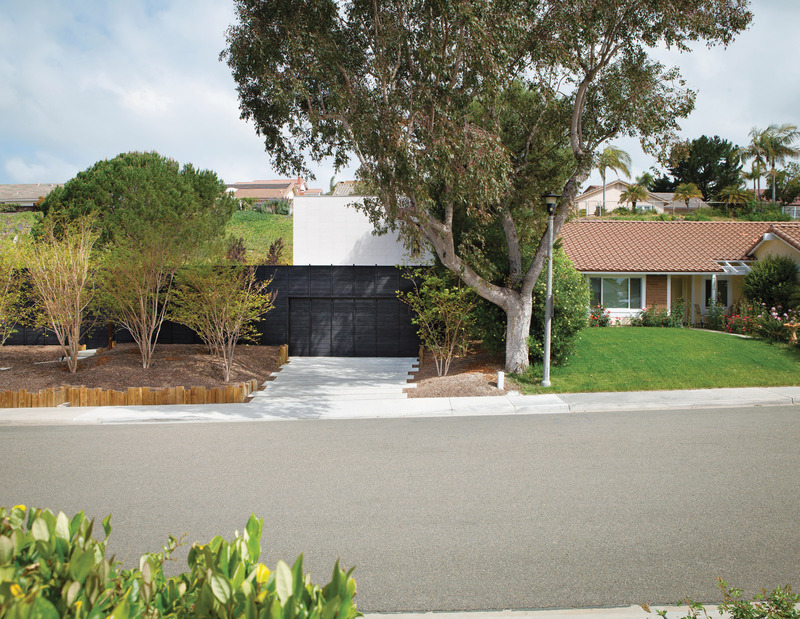 “They didn’t want a show-off house; they wanted somewhere they could live forever.” After find-ing out that the property was subject to neither design restrictions nor neighborhood reviews, Mariscal’s San Diego–based design-build team transformed the typical ceramic-shingle-roofed rancher (after completely deconstructing it) into a one-of-a-kind architectural achievement. “It’s great when you find a client that challenges you to do something more meaningful,” says Mariscal. “They really trusted me.” And so the Wabi House serves as an object lesson in how the most spectacular creative results are accomplished: through the confident patron-age of dedicated, willing clients. At the client’s request the kitchen contains neither upper cabinets (Shino can’t reach them) nor an oven (they only used the old one once—to reheat a pizza). A modular Roche Bobois Mah Jong sofa adds a decorative flourish to the living area while maintaining as low a profile as the traditional Japanese furniture. Image courtesy of ©2010 DANIEL HENNESSY PHOTOGRAPHY. An atypical modern house that translates the lan­guage of traditional Japanese building into a Southern California context, the Wabi House is a compelling study in contradictions. “I was playing with an idea of opposites,” Mariscal says. “For instance, from the street you don’t see any windows, but once you go inside, it’s almost all open.” Although the roof deck affords a view of the surrounding area, the lasting impression of the Wabi House is of a building that focuses inward onto the very specific lives of its residents. It may be an average lot on an average street, but when Shino and Ken return home, they have an extraordinary kingdom to themselves. For more images of the project, view our slideshow and go behind the scenes of the photo shoot in our video.